Nokia X6 mobile some time got very strange problem that when we on camera then mobile just hangs and camera also don’t work. So we can’t capture image and record video and mobile also hangs when we open camera. When we open camera it will shows camera failure or hardware failure restart camera message. This problem appears due to sometime software reason or some time hardware problem. So here we consider both methods one by one. 1. First we apply software methods and we should flash mobile with latest version. 2. Open camera and press option an open camera setting then press restores camera setting then mobile camera setting will restore to its factory condition then check camera. 3. If no luck then open mobile and first we should change camera switch and check for solution because sometime camera switch got internal shorting and due to that we got this error. 4. 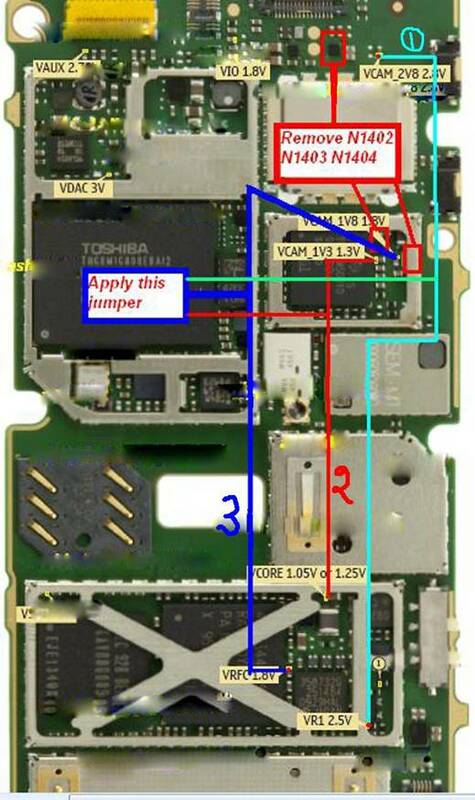 After changing switch if no solution yet then we have to use jumper setting as described below. 5. According to image we have to remove three camera transistor and IC as N1402, N1403, and N1404 carefully. 6. We have to remove these ICs because these ICs got internal problem in their circuit so due to that we got this type of error. 7. After removing all those we should first jumper from a point on PCB to resistance as shown with blue mark line in above image. 9. Last connect a jumper between two more resistances as shown in image with blue color mark line. 10. After successful applying these entire jumpers now check camera and mobile for problem our problem will solve definitely. During all these IC removing process we should properly remove ic because in any nearer component are shorted then we will get more problem so be careful.